The Islamic State of Iraq and the Levant, alternatively translated as Islamic State of Iraq and Syria or Islamic State of Iraq and al-Sham, is a Salafi jihadist militant group that follows an Islamic fundamentalist, Wahhabi doctrine of Sunni Islam. The group is also known as Daesh, which is an acronym derived from its Arabic name. Founder: : Abu Musab al-Zarqawi, 1999. ISIS proclaimed a worldwide caliphate in June 2014 and named Abu Bakr al-Baghdadi as its caliph. As of December 2015, the group has control over vast landlocked territory in Iraq and Syria, with a population estimate ranging between 2.8 million and 8 million people and where it enforces its interpretation of sharia law. ISIL affiliates control small areas of Libya, Nigeria and Afghanistan and operate in other parts of the world, including North Africa and South Asia. Syrian Democratic Forces prepared a ceremony marking the "100% territorial defeat" of ISIS at the al-Omar oil- field base in eastern Syria. ‘A tiny spot that will be gone tonight,’ president says. President Trump said the Islamic State extremist group would suffer its final territorial defeat by Wednesday evening, even as U.S.-backed fighters in Syria were still completing the battle against the militants. 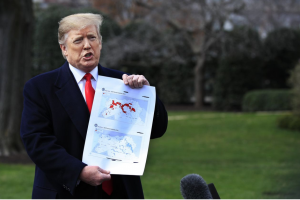 Speaking to reporters before traveling to Ohio, Mr. Trump held up an image of two maps, one depicting how much territory was under Islamic State control on Election Day in 2016, and the second showing the small area that remained as of Wednesday. Pointing to the second map, Mr. Trump said: “In fact, there’s actually a tiny spot that will be gone tonight.” Mr. Trump’s assertion wasn’t confirmed by Pentagon officials, who said that while Islamic State’s defeat was imminent, the formal end of the group’s self-proclaimed caliphate likely is days away, not hours. Mr. Trump said 400 U.S. troops would remain in the country after Islamic State’s defeat. U.S. defense officials have told The Wall Street Journal that as many as 1,000 troops could remain in the country, a residual presence needed to prevent a resurgence and ensure stability of areas cleared by U.S.-backed local forces. Local ground forces known as the Syrian Democratic Forces have led the anti-Islamic State campaign, with support from a U.S.-led international coalition, which said the pace of combat had slowed Wednesday. Immediately after Mr. Trump’s remarks, White House officials said they had no announcements to make regarding the state of the campaign. The SDF would likely first announce the defeat of the extremist group, U.S. defense officials have said. On a Twitter account associated with the SDF, a map was posted Tuesday showing a piece of land still under Islamic State control. 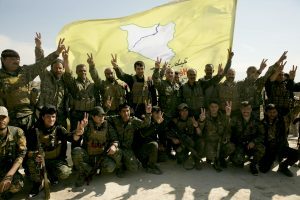 But the SDF had not declared the group’s defeat as of Wednesday afternoon. ISIS bride Hoda Muthana speaks about returning to U.S.
Any Questions About Intentions Now? ISIS Surprised Obama - Really!